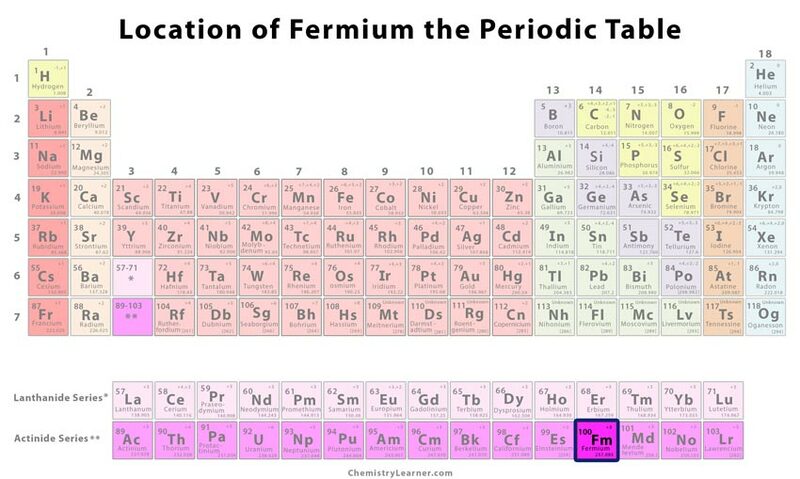 Fermium (pronounced as FER-mee-em)  is a synthetic, transuranium, radioactive element  with the symbol Fm  belonging to the family of inner transition metals . It has 18 isotopes with mass numbers ranging from 242 to 259 of which Fm-257 is the most stable isotope with a half-life of 100.5 days [2, 3]. It decays into californium-253 through alpha emission and spontaneous fission . It cannot be found naturally on earth . However, it can be obtained in microgram quantities by the neutron bombardment of plutonium in a nuclear reactor . 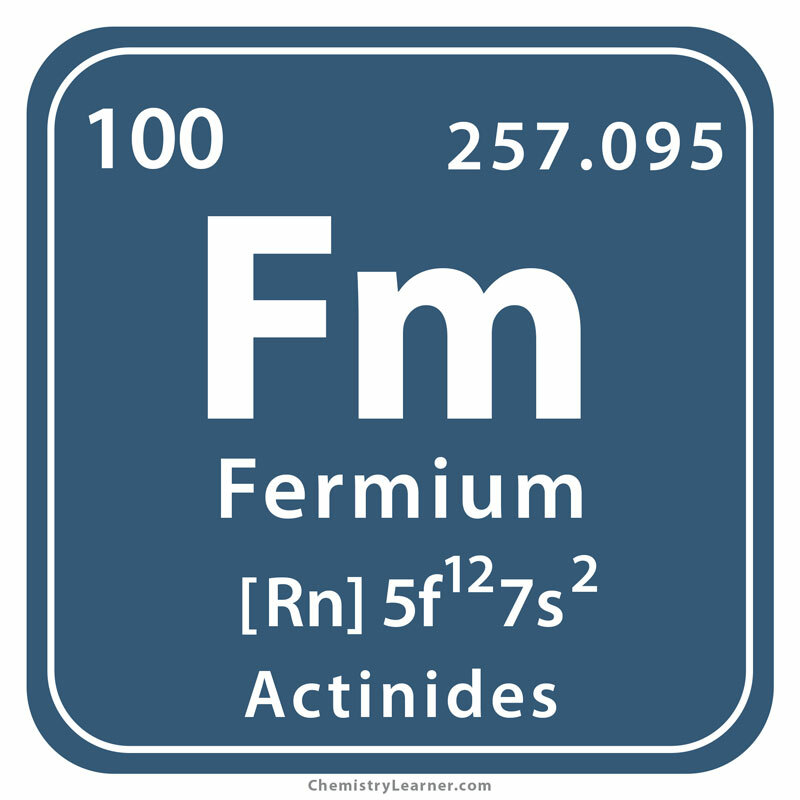 Origin of the Name: The element is named after the famous nuclear physicist Enrico Fermi . Who Discovered it: It was discovered by a team of scientists led by Albert Ghiorso on October 31, 1952 [2, 3]. 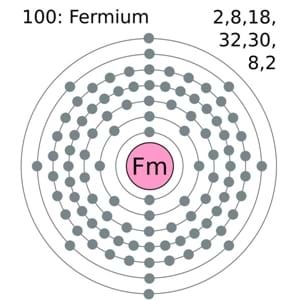 The first isotope of fermium (later named as fermium-255), was found in the nuclear debris after the thermonuclear explosion of the first hydrogen bomb (codenamed Ivy Mike [3, 10]) on an atoll in the Pacific Ocean . It was because uranium-238, the source of heat for the detonation, was exposed to a flux of neutrons during the process and combined with 17 of them to produce Fm-255 that has a half-life of about 20 hours [1, 2]. It was later produced in the laboratory by a group at the Nobel Institute of Stockholm. They bombarded uranium-238 with oxygen nuclei producing fermium-250 with a half-life of 30 minutes . Due to its minute production and short half-life, it is used for research purposes only . It is potentially dangerous due to its radioactivity . 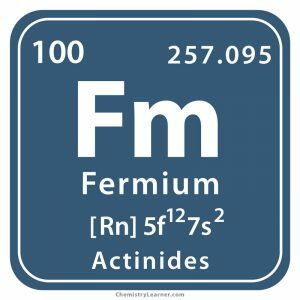 Fermium, along with Einsteinium, was one of the first synthetic elements produced after the testing of a hydrogen bomb [10, 15]. As the hydrogen bomb testing was top secret, researchers could only publish the discovery of Fm in 1955 after producing it officially in a laboratory [1, 3, 10]. Unavailable since it is not found naturally and only produced in nuclear reactors .